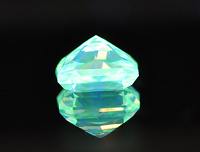 Very Strong Green FluorescenceWhen looking to expand ones diamond collection, people, in general, are looking for the same type of arrangement. The goal is to attain the largest and best quality stone possible for the lowest overall cost. Many characteristics, such as the 4Cs, play extremely important roles in the quality of the precious stones. However, what many don't consider are the features that are relatively blind to the untrained naked eye. Some of these features may slightly reduce the stones overall value, but because they are not easily seen, they won't significantly decrease the quality of the diamonds themselves. Diamond Fluorescence is a perfect example of a one of these features. It can slightly help reduce the cost of the diamond, while not necessarily lowering the overall value of the stone. Those with years of professional experience can often distinguish the slight difference in appearance under regular lighting. However, to the untrained eye, the fluorescence in a diamond is not noticeable unless seen under ultra violet lighting. A pure colorless diamond actually has no compound elements of any kind. Only, to find such a prize is absolutely unheard of. The diamonds found are precious stones created with various compound elements absorbed over millions of years in the making. The different elements included in the composition are precisely what define the type of diamond it is. The additional elements that can be absorbed into the diamonds composition and cause fluorescence are nitrogen, boron, and aluminum. The fluorescence is in essence the inclusion of these elements that cause this magnificent glow. 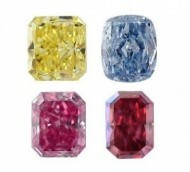 Depending on the stones composition, in Fancy Color Diamonds it can appear in a number of different shades or colors such as blue, yellow, white, orange, green, and pink. In colorless diamonds, fluorescence will generally appear only in a yellow or blue tint. Since diamond fluorescence can glow at different levels, the GIA developed a grading scale to measure the strength of the illumination. If you don’t have access to an ultra violet lamp to view the diamonds, try using a regular black light to cause the affect. Diamonds were created millions of years ago, deep below the surface of the earth. Over time, while forming, these stones absorbed trace elements of various other minerals. The elements absorbed into the composition of the stones is actually what cause the development of fancy colors as well as the magnificent fluorescent glow. Only about 35% of stones available today actually have fluorescence and only about 10% of those have enough fluorescence to cause a change of appearance under ultraviolet light. Fluorescence in a diamond can only be distinguished by the untrained eye under ultra violet lighting. Even a very strong fluorescence will appear extremely faint under direct sunlight. Depending on the color of the stone and the color of glow, it can sometimes positively add to the color of the stone. Another point to consider is the fact that because of the slightly negative connotation, it can be an excellent way to get your hands on a beautiful stone that is a little bit above your price range, especially if it is a fancy color diamond where the color is generally rarely affected. As a result of the addition, the cost will most likely be reduced. Depending on the intensity of fluorescence, you might find a little more room to negotiate on the price. Depending on the type of stone you are looking for, the glow can have a different effect on the color. In the following two examples, the fluorescence is specifically what improves the quality of the stone, even though the value will still be slightly lowered. 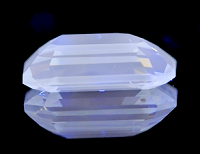 Scenario 1: A colorless diamond with an 'I-J' color grade and a 'Blue' fluorescence. Under certain lighting, the additional glow can actually help to enhance the color of the stone and make it appear as if it is a higher grade color than the stone actually is. Scenario 2: A fancy colored diamond that is a ' Fancy Intense or Fancy Vivid Green Yellow' stone with 'Very Strong Green' fluorescence. 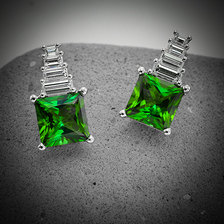 Under certain lighting, the effect can cause the secondary green to glow, which is a rarer color than the dominant yellow, to shine more intensely and actually improve the color of the stone. Another important point to consider before purchasing a stone is exactly what you plan to do with it. If your plan, for example, is to place more than one diamond on a piece of jewelry, the different fluoresce from each stone might appear as a slight unbalance once put next to one another. However, don't let this stop you from constructing a beautiful piece of jewelry. If it is done right, perhaps with a little professional direction, the outcome can be absolutely magnificent. The question of whether this is a positive or negative trait is actually quite a debated subject. There have been many different opinions on the matter which both argue very true statements. Whether this phenomenon should be considered a positive trait or not, will depend entirely on the color of the diamond and the color of the glow. Not all diamonds fluoresce, and ones that do can be measured. In general, the price will not be affected if it is a 'Faint' fluorescence and might be affected if it's 'Medium' (depends on the characteristics of the stone itself). However, if there is a 'Strong' or 'Very Strong' presence in the stone, the price will likely be reduced. The resulting effect depends on the color grade of the stone together with the grade and color of the fluorescence. The most common fluorescence in colorless diamonds is blue. 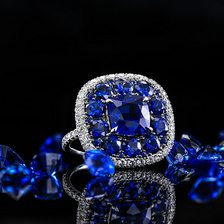 In a lower colorless diamond grade, a blue fluorescence may compliment the color of the stone. 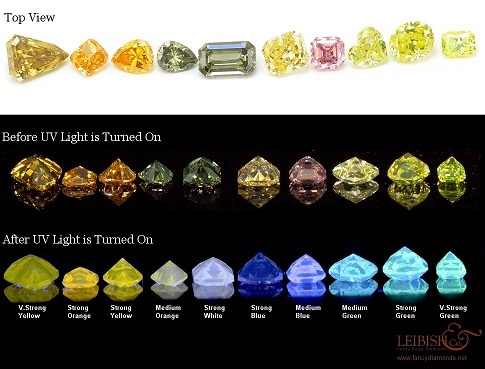 However, in a higher grade stone, a yellow fluorescence can negatively affect the clarity by withdrawing from the color or causing a milky or cloudy overcast. What can be said with some certainty is that, under the right lighting, it can actually add to lower grade diamonds while taking away from higher grade stones. In most fancy colored diamonds, the fluorescence might not actually reduce the intensity of the stone. Interestingly enough, the glow together with the combination of the diamond color, can often complement each other. Under the right lighting, this amazing phenomenon can actually help enhance the magic of the color. Finding a yellow diamond with fluorescence is actually quite common. However, the illumination level is usually quite faint. When purchasing a yellow diamond, be sure to speak with the vendor and ask what type of effect the fluorescence has on the stone. In certain cases it might not be noticeable. In others, it can give the stone a slight brownish tint or even a milky appearance. The benefit is that if the fluorescence is not visible, for a significantly reduced cost you can acquire a stone that looks no different from one without any fluorescence at all. Pink colored diamonds, on the other hand, are quite difficult to find without fluorescence. In fact, since the addition is so common, especially in Argyle pink diamonds, even a strong grade will generally not negatively impact the value of the stone. In general, a pure blue diamond will not have any fluorescence at all. In the event that fluorescence is found, which most likely means that the diamond is slightly combined with a greenish overtone, the fluorescence will usually not even be noticeable. Like anything else in life, the rarer things are, the more some want to get their hands on it. Certain shades of fluorescence are even considered by some, collector's items. For example, a red fluorescence is so rarely seen, when it is found it is celebrated. Be sure to ask the jeweler for their recommendations on the stones. Whether positive or negative, to see the affect in reality is breathtaking. Have a look at the image below. Images like this are the reason diamond fluorescence is sometimes referred to as magnificent. From left to right: Fancy Deep Brownish Yellow, Fancy Vivid Yellow Orange, Fancy Vivid Yellow Orange, Fancy Deep Grayish Yellowish Green/Chameleon, Fancy Dark Gray Yellowish Green/Chameleon, Fancy Intense Yellow, Fancy Pink, Fancy Greenish Yellow, Fancy Intense Green Yellow, Fancy Intense Green Yellow. Most importantly, you should be happy with the diamonds you purchase. Make sure to speak to the retailer you are dealing with and find out all the information upfront. Have a look at the stone under different lighting and always look over the certificate.